The Society of Collision Repair Specialists will hold its quarterly open board meeting from 3-5 p.m. Tuesday, and everyone’s welcome. The event will take place at the DoubleTree Hilton in the Seattle area, the venue for the Collision Industry Conference Wednesday and Thursday. 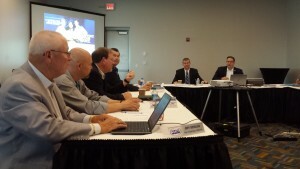 Get updates on what the collision repair trade group has been up to over the past three months. SCRS’ 2016 Board of Directors election will take place at 5:15 p.m. PT; all dues-paid members or designated representatives of affiliate/corporate partners may vote. Members will have five options to fill four open SCRS board seats. Four hopefuls and Vice Chairman Kye Yeung of European Motor Car Works (Calif.) were nominated to fill the posts held by Yeung, Luis Alonso (Pan American Collision), Rodes Brown (Sherwin-Williams) and Paul Val (Raintree Auto Body). Alonso, Brown and Val are all term-limited out. The other nominees include Trace Coccimiglio, Valet Auto Body (Utah); Dave Gruskos, Reliable Automotive Equipment(N.J.); Jeff Kallemeyn, Kallemeyn Collision Center (Ill.); and Tim Ronak, AkzoNobel (Calif.). Nominations closed March 5. Learn more about the five candidates here. SCRS board members serve two three-year terms. Voting is open to all individual SCRS members and a single representative from each state affiliate organization or corporate member, so long as the voter’s dues are paid up by Tuesday’s election. The board members themselves will elect their executive committee, including their 2016-17 chairman and vice chairman. Current Chairman Andy Dingman and Vice Chairman Kye Yeung are both eligible for a second one-year term as the organization’s leaders, should they seek the jobs and Yeung win re-election. If you can’t make it to these events, follow along with Repairer Driven News’ live update feed, which will launch at 3 p.m. below for the open board meeting and continue through the election. Follow along with @repairerdriven or join the conversation with #CICApril2016.